CyStellar is a geospatial intelligence company on a mission to deliver real-time insights for the insurance, logistics and agriculture sector to support data-driven strategic and operative decision making. 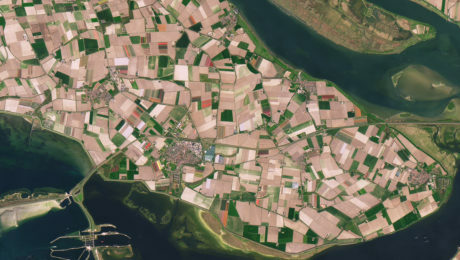 Can you spot the tulip fields in the following satellite images? The amount of land dedicated to growing bulbs in the Netherlands has soared by almost 75% in the last 35 years. Most bulbs are grown in the sandy soils of Noord-Holland but the Drenthe, Flevoland, and Overijssel regions are quickly catching up. There are more than 400 tulip growers in the Netherlands. 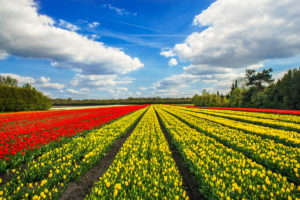 The Dutch tulip sector will break the two billion flower barrier this year for the first time according to the Royal General Bulb Growers’ Association (KAVB). These are a lot of tulips, so many that we should be able to spot them from the space.